As a cosmetic dentist dedicated to the complete oral care of his patients, Dr. Jeffrey Emmi offers dental services that extend beyond the care of the teeth and gums. The jaw bone is vital to creating a mouth that functions fully and comfortably. Problems with the jaw bone can throw off the alignment of the teeth and make the teeth vulnerable to excessive wear and tear and structural damage. 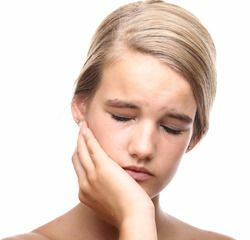 That is why Dr. Emmi and his team at Smile Solutions offer their Wilmington patients TMJ disorder treatment to address one of the most common conditions that affects the movement and function of the jaw. Any combination of the above symptoms may be an indication of TMJ disorder. Patients experiencing any of these symptoms should see Dr. Emmi so that a diagnosis and treatment can be determined. The use of a dental mouth guard: A dental mouth guard is often the first treatment option for TMJ disorder because it is a conservative treatment that is often very effective. A dental mouth guard can hold the teeth in proper alignment while a patient sleeps and prevent clenching and teeth grinding. For many patients, a dental mouth guard can significantly decrease or eliminate the symptoms of TMJ disorder. Restorative care: Restorative dentistry is another effective TMJ treatment. Whether the teeth require orthodontic care or restoration of damaged teeth, restorative dental treatments can properly align the teeth and repair the damage of clenching and grinding. Patients with teeth that are strong, healthy, and properly aligned are less likely to experience the symptoms of TMJ disorder. Oral surgery: Oral surgery is the last option in treating TMJ disorder. If no other treatments have effectively alleviated the signs of TMJ disorder, then Dr. Emmi and his team will consider oral surgery. Under the skilled and experienced hands of our dentists, oral surgery is a safe and effective treatment option for TMJ disorder. If you are experiencing the signs of TMJ disorder, it is important to seek treatment. Dr. Jeffrey Emmi can alleviate the discomfort of TMJ as well as restore the health and strength of teeth that have been affected by this condition. Schedule an appointment with Dr. Emmi at your earliest convenience to learn how you can eliminate the pain of TMJ disorder.